Some western mediators believe a compromise had been possible, but was nixed by hard-liners in Cairo. The bloodshed unleashed when Egypt’s security forces assaulted two protest camps in Cairo on Wednesday has likely suspended hopes of any imminent political solution to the six-week standoff over deposed President Mohamed Morsi. But international mediators who had worked to broker a compromise believe that a deal was possible – and may have been overruled by Egypt’s security chiefs, in a grim portent for the country’s political future. Mediators believe they had won the consent of the Muslim Brotherhood, which led the pro-Morsi protests, for a deal that would have brought the two sides back from the brink and reintegrated the Brotherhood into politics. That deal, according to some familiar with the content of the negotiations, would have required a series of confidence-building measures, mostly on the Brotherhood’s part. Despite their fiery rhetoric, some of the movement’s leaders who had managed to avoid the dragnet that saw thousands of their comrades jailed and their protest camps under siege, had been quietly engaged in talks. And in a breakdown that may be telling for Egypt’s future, it appears to have been hard-line security chiefs who scuttled the deal, dismissing the Brotherhood’s apparent willingness to compromise as a ruse to gain time. But Wednesday’s offensive by security forces appears to lack a clear political endgame. 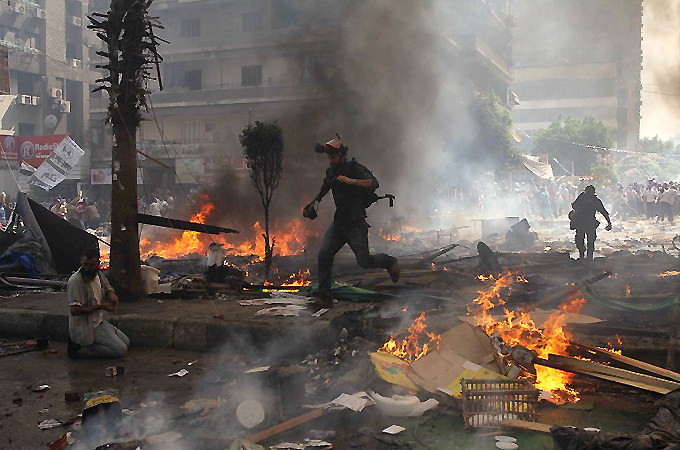 “Is Egypt closer to dealing with this very serious political divide and crisis? The obvious answer to that is no,” Al Jazeera was told by Michael Wahid Hanna, a senior fellow with Washington’s Century Foundation, who had spoken with figures involved in the negotiations. “This runs the risk of metastasizing the problem, expanding it,” he said, predicting greater militancy among Islamists. According to participants in the talks, Hanna said, General Abdul Fattah el-Sisi had appeared ambivalent about whether to clear the sit-ins at Cairo University in Giza and at the Rabaa el-Adaweya Mosque in Nasr City, which had turned into sprawling, full-service camps after six weeks of protest. The military chief was “not on the hawkish end of internal deliberations”, Hanna said. US officials had also clearly pressured Sisi and others to refrain from attacking the protests. The Pentagon publicised the fact that Defence Secretary Chuck Hagel had regularly spoken with Sisi by phone following Morsi’s ouster, while Burns spent nearly a week in talks with different power brokers in Cairo earlier this month. Western diplomats involved in those talks seemed almost baffled by their failure. “The hardliners have a remarkable ability to ignore reality,” an unnamed diplomat told Reuters. In his press conference, Interior Minister Mohamed Ibrahim reinforced fears among both Brotherhood supporters and many liberals and leftists that the July 3 coup marks a return of the regime of longtime president Hosni Mubarak. Ibrahim promised “that as soon as conditions stabilize and the Egyptian street stabilises, as soon as possible, security will be restored to this nation as if it was before January 25, and more”. 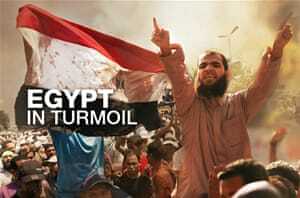 January 25 refers to the day, in 2011, when Mubarak was ousted. “These people have a very warped view of what counts as restraint,” said Joe Stork, deputy director of the Middle East and North Africa division at Human Rights Watch. Stork said there was “no question” that some of the demonstrators at the sit-ins had been armed, and he believed that reports of anti-Morsi protesters being detained and tortured in the sit-ins were credible. Still, he said, security forces had far abused their authority. Even though some of the protesters were armed, Stork said, most were unarmed. “So it was a policing situation, it wasn’t a military clash,” he continued, suggesting that the action of the security forces had violated international standards. The political fallout of the security forces’ action against the protest camps remains to be seen. There were many signs that harsh action to clear the sit-ins had some measure of popular support. But ElBaradei’s resignation may be telling, because, according to Hanna, it “chips away at the civilian character of the state, and it begins to look much more like a military regime”. That would pose a problem for the US, which supports the Egyptian military with an annual stipend of $1.3bn, but whose laws require cutting military aid in the event of a coup. The Obama administration has declined to characterise Morsi’s ouster as such. Secretary of State John Kerry on Wednesday condemned the crackdown, calling it “deplorable” and a “serious blow to reconciliation”. And, he warned, “The interim government and the military, which together possess the preponderance of power in this confrontation, have a unique responsibility to prevent further violence”. An administration source told CNN that the White House was considering cancelling this year’s Operation Bright Star, a huge, biennial military exercise between the US and Egypt. The Pentagon declined to comment on the report. Marc Lynch, a George Washington University historian of the Middle East, called for the administration to “suspend all aid, keep the embassy in Cairo closed, and refrain from treating the military regime as a legitimate government” if it “remains on its current path”. But Sisi and most of those he appointed believe – and perhaps rightly so – that the majority of Egyptians sympathise with their stated goal of “stabilising” the country, even if that means pushing the Brotherhood underground. ElBaradei’s stance, in fact, may be a lonely one. Hours before he tendered his resignation, the National Salvation Front (NSF) – the country’s broadest opposition coalition, founded in November to counter Morsi’s power grabs and led for most of its duration by ElBaradei – issued a statement applauding the crackdown, saying that Egypt had “raised its head high in victory over those who traffic in the name of religion”. Ahmed Khairy, a member of the liberal Free Egyptians Party – one of the NSF’s primary members – said the Brotherhood had brought the crackdown upon themselves, and that “the real popular will was to push them out from the ruling position, because what we have reached now is due to their stubbornness and denying the facts on the ground”. After ElBaradei resigned, the NSF expressed its regret, chastising him in a statement for not consulting beforehand, and stating the body’s “steadfast” support for the military-appointed government. As usual, US with its hypocratical statement, twisting and playing with their mother tongue, to show to the world as if that they are concerned with the situation in Eqypt which in actual fact they don’t give a damn..because the killing of muslim is not their concern and furthermore it is done by so-called muslim military!! In other words muslim killed muslim is good news for them! As simple as that!! Let what is happening in that part of the world be an inspiration to all the Malaysians ! Especially so when Malaysia is ALWAYS proud to be a part of the Arab world and even using Jawi in all the diplomat missions to depict their presence all over the world, as though Malaysia is part of the Arab world, ignoring the use of the Bahasa Melayu which all Malaysian students are forced to learn. What is that for ? When the government themselves is not using what they teach and demand the Malaysian students to learn in school ?